You know why I miss Earth-2? It was the fact that DC had the first super-team ever created, the Justice Society, and they allowed them to change over time. They banded together shortly before World War II. 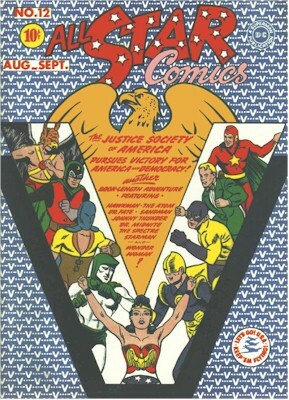 After the US got involved in the war, the cover to All Star Comics #12 proclaimed the JSA's patriotic spirit. With such powerful members as Dr. Fate and the Spectre, how come Hitler and Tojo didn't crumble immediately? 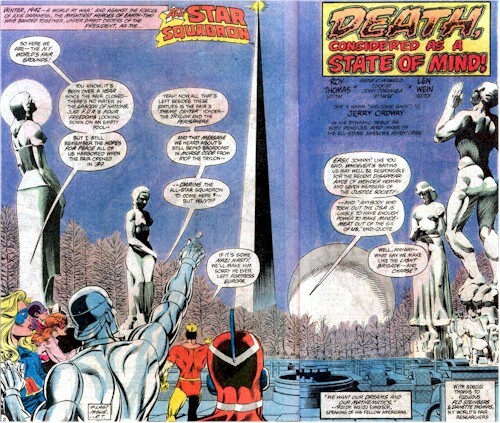 We wouldn't find out until 40 years later, when Roy Thomas created the All Star Squadron. The A.S.S. (ok, go ahead and laugh) assembled all the DC heroes who existed in the 1940s (including the JSA) to help defend the United States at home. Mystical objects prevented the heroes from travelling to Europe and Japan. The A.S.S. had a super-cool headquarters that utiltized buildings from the famous 1939 New York World's Fair: the Trylon and Perisphere. Thomas was a history buff and constantly wove historical events and landmarks into the series. 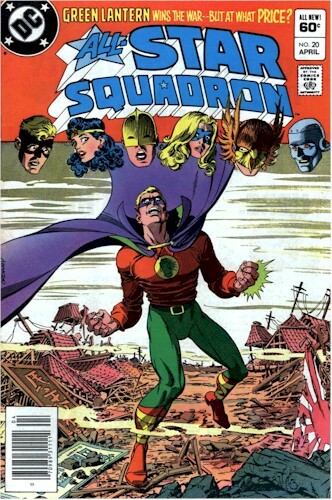 All Star Squadron hit a creative zenith with issues 20-30 when Thomas was paired with Jerry Ordway on the art. Ordway had started out as an inker with the first issue, and you could tell that his embellishments created some fine artwork. When he started pencilling, the book was ignited with his energy. Ordway's dramatic cover of Green Lantern standing in a devastated Japanese city was astonishing. Thomas and Ordway teamed up later on to produce Infinity Inc. 1-10. 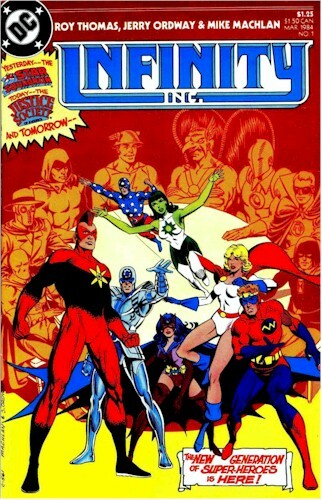 Infinity Inc. was the next generation of the Justice Society, set in 1983. You will recognize that many of these characters in the modern era, appearing in JSA, Outsiders, Infinite Crisis, etc. The initial adventure was spread over 10 issues and featured the young heroes in a conflict against their parents. Roy Thomas loved the Earth-2 characters and spun a great mythology around them. What did he get for his troubles? When Crisis on Infinite Earths appeared, he was told to get rid of the aging JSA. One reason for this is that DC didn't want 2 versions of various heroes running around. 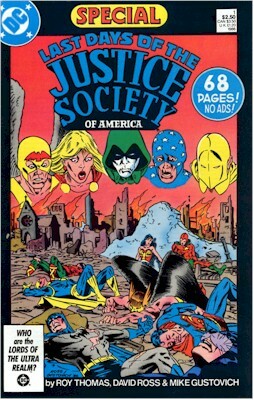 "The Last Days of the Justice Society" special consigned everyone (except Spectre and Dr. Fate) to Valhalla, where they would battle Ragnarok for eternity. 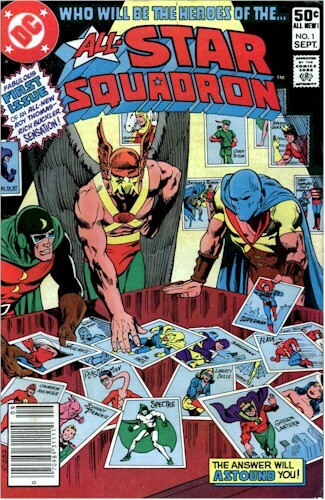 On a text page inside, Thomas wrote: "This is the JSA story I really never wanted to write." In a way, Thomas did a sneaky thing. He didn't kill the Golden Age heroes, he merely shuffled them off to the side. Thank god, because another writer got them out of there and we have some of the JSA still around today. Nuff said.